The NSEL scam has hit the financial community hard and raised questions on the governance of exchanges and brokers and the concept of a commodity exchange itself. The newspaper headlines are mostly relating to NSEL scam and it's estimated scale of Rs. 4,000 crores to Rs. 6,000 crores. Many people who invested in e-gold, e-silver and ETF's are worried about their hard earned money and what will happen to it. Even those who trade in the commodities market are fearing a shut down. So what is the NSEL scam all about? 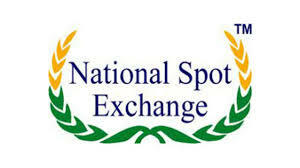 NSEL stands for National Spot Exchange Limited and is owned by Financial Technologies which also owns the MCX. NSEL was operating unregulated as it didn't come under the scrutiny of the Forwards Market Commission (FMC) because of it being a Spot market. The whole fiasco was on the trading of Agri-Commodity products on NSEL. Contracts of T+2, T+3,... T+35 were launched when as per laws a spot exchange cannot launch contracts having settlement greater than T+11. T+2 means that the settlement between the buyer and the seller will happen after 2 days of the trade, T+3 means 3 days and so on. So what was the game? Let's take an example of the commodity "Paddy Basmati". There are many contracts running on it. T+2 is trading on Rs. 2,780 and T+35 is trading on Rs. 2,829.7. The price difference is due factors like time value of money, seasonal cycles, etc. A long-term contract is usually higher priced than a short term contract. The trade involved a simple arbitrage of buying the T+2 contract and selling the T+35 contract. So, you basically bought the T+2 contract at Rs. 2,780 and took delivery on the 2nd day, stored it in the NSEL warehouse and delivered it to the person to whom you sold the T+35 contract on the 35th Day for Rs. 2,829.7. In this way you made a cool 13.5% annualised return which was in every way totally RISK-FREE. Look at the sample image of a trade note for this type of a transaction. What happened next was that the brokers of the NSEL started selling this product to investor's by assuring them of returns more than that of what the banks could offer. Once the investors realised the potential of these trades, they undertook bigger contracts and on a regular basis. 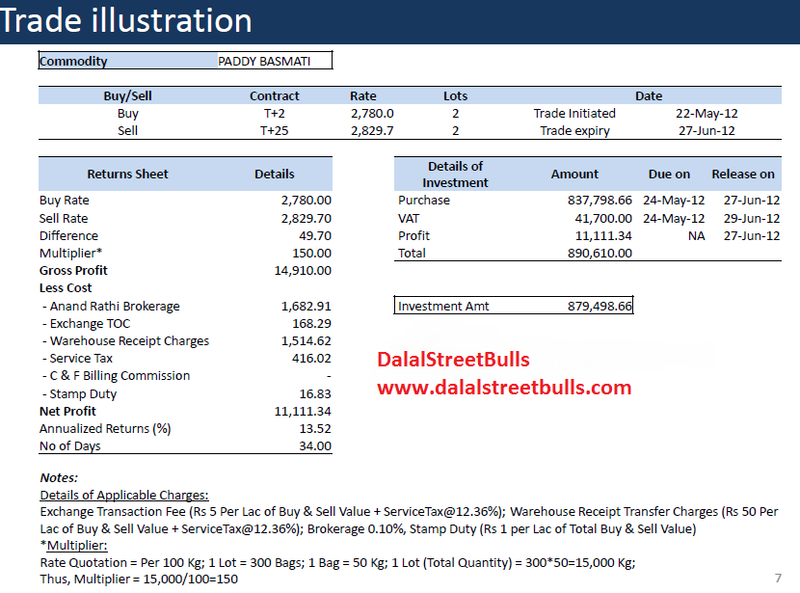 The brokers and NSEL generated high revenues due to these trades for 2 years! The profits of NSEL shot up from Rs. 30 Crores per year to Rs. 120 crores per year. The price gap between the contracts continued and thus commodity prices also started moving up. The Department of Consumer Affairs noticed this and sent a notice to the NSEL saying that it can't run such type of contracts and that it will fall under the radar of the FMC. So, the NSEL closed down all contracts greater than T+10 in period. As a result, the arbitrage opportunities closed down. Soon, news broke out that there was no stock in the godowns of NSEL and the buyers were being given fake ware house certificates of the commodities which they were buying. As noone takes delivery of goods and this was just pure speculation, this went totally unnoticed . NSEL had not anticipated this and now the investors are demanding back their money which the NSEL is unable to repay. Also, they don't have stock which they can sell and settle the investor's demands. FT had earlier said that they will sell the stock in godowns and payback the investor's but now it is unclear as to how this whole "GAFLA" will be settled. We have tried to explain the NSEL scam in simple words for the knowledge of the investor community. Hope it helped you in understanding the "NSEL scam." But if NSEl took money from Investors then why can't it simply cancel the old contract and return the principal amount? What about money for those Investor Who invest threw E Series ?